TechMarathi.com is a sister site of PuneTech, that focuses on publishing technology articles in Marathi for the benefit of Marathi speaking population who would like to stay abreast of the latest in technology. Every year, in the time-honoured tradition of Marathi periodicals, TechMarathi publishes a special Diwali online magazine for the the past 2 years. This year too TechMarathi is planning an online “e-Diwali Ank” – a Diwali Special “bumper” edition of articles. short story. It can be an article, poem, cartoon, or any other form of content. You can even translate an existing English article to Marathe – even that can be quite valuable. Send the articles in Unicode. All rights to approve articles for publishing will be with the committee appointed by TechMarathi, and their decision will be final. TechMarathi.com is a sister site of PuneTech – a site that focuses on publishing technology articles in Marathi for the benefit of people who are not yet entirely comfortable in English, but would still like to stay abreast of the latest in technology. This year, in the time-honoured tradition of Marathi periodicals, TechMarathi is planning a “Diwali Ank” – a Diwali Special “bumper” edition of articles. If you are a techie who can write in Marathi, please consider contributing an article. You can even translate an existing English article to Marathi – even that can be quite valueable. The article can be humorous, informative, experience sharing, or a short story. It can be an article, poem, cartoon, or any other form of content. Please send short articles of about 250-300 words, or longer ones of 400-500 words. Please get in touch with pallavi@techmarathi.com for details. TiE Pune, the Pune Chapter of TiE the worldwide community of entrepreneurs, has just won the “Best Turnaround” award at the TiE Annual Global Retreat in Athens Greek. They competed with 61 chapters globally, and were selected from 5 finalists. 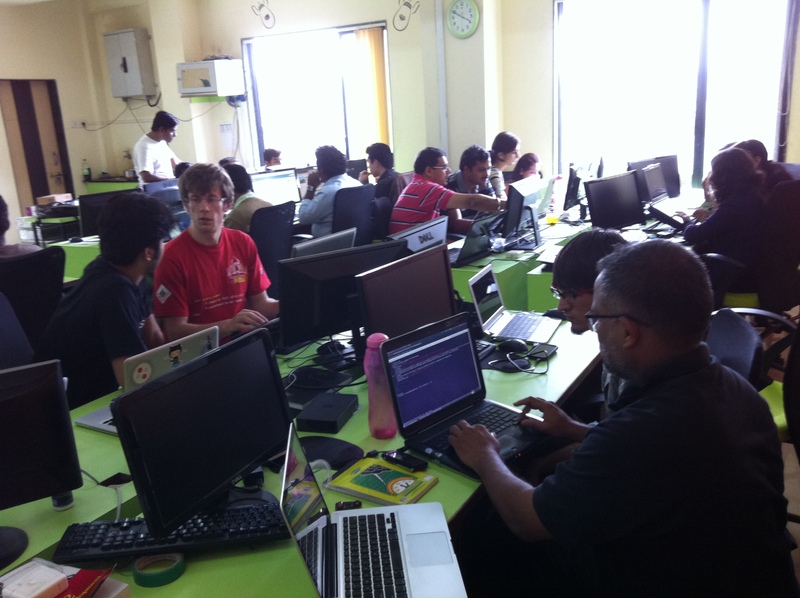 5 years ago, when PuneTech and the Pune Open Coffee Club started, TiE Pune was dormant, and used to have one event per year (or less). 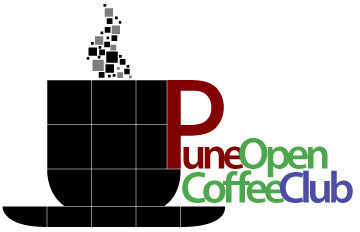 In fact, it could be argued, that neither Pune Open Coffee Club nor PuneTech would have actually gotten started if TiE Pune had been active. To support TiE Pune in these activities, you should consider buying a TiE Pune membership. The problem is well known in the IT industry in India – why are smart techies tempted to switch to the management ladder, a few years into their careers? The industry loses technical talent, and quite possibly, gets saddled with mediocre management talent in the bargain! Techies who stay on the technical track complain about a lack of control, a lack of visibility, and a lack of rewards. Society also seems to treat “managers” as an exalted breed, and someone who remains an individual contributor is seen as having stagnated in his or her career. The Ninja Club at BMC is a techies-only club, created to provide cross-team visibility for techies, encouraging collaboration, peer reviews of design and code, and in general, letting the smartest techies interact with each other more easily. Organizations are taking different approaches to tackle this problem – including creating explicit technical ladders, giving more high-profile recognition for technical accomplishments, even awarding junkets for creating IP. At BMC Software, we have taken a somewhat different approach – a grassroots effort in the technical community that is backed by, but not actively promoted by management. It’s loosely patterned after the martial arts, and is called the Ninja Club. The Ninja Club is a forum created by techies, for techies. Its membership is self-selected (by invitation), purely on the basis of demonstrated accomplishments on the technical front. As such, membership itself is a badge of honour. In addition however, like in a martial arts discipline, members qualify for different coloured belts – starting with white, and earning their way to black. These belts are completely independent of the usual grades or bands in the HR system, and unrelated to promotions and performance evaluations. 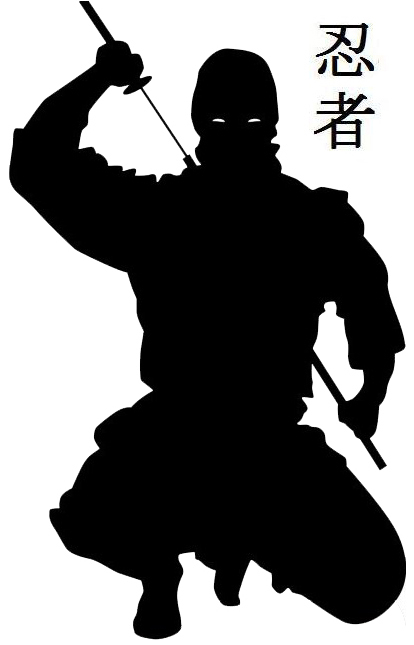 A points system has been put in place – a Ninja earns points for activities such as technical talks, participating in coding contests and ideation sessions, filing invention disclosures, publishing conference papers / whitepapers, etc. Points make you eligible for ‘promotion’ to the next coloured belt: white –> yellow –> green –> red –> black. But promotion is not necessarily automatic – in addition to points, the Ninja may have to get past, for example, an online programming test or an interview by other Ninjas at the higher belt level. 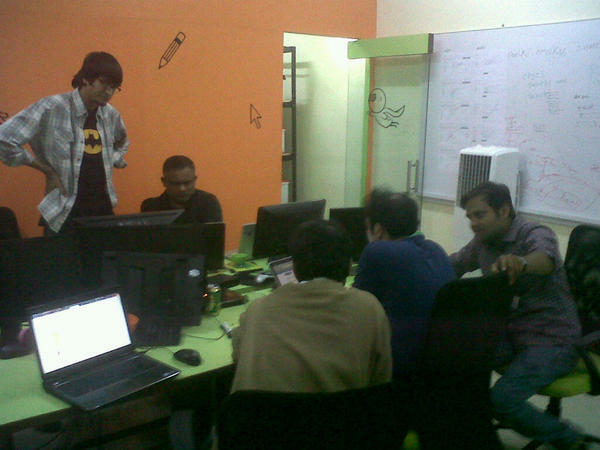 Like martial artists, the idea is that Ninjas get together regularly to practice their skills – coding, design, etc. – and to learn from each other. To that end, the Ninja Club organizes various activities such as coding contests, design review sessions, etc. for club members. We are also starting Special Interest Groups (SIGs) focused around technology areas like Big Data, Cloud Computing, SaaS, etc. Discussions can also be around the business domain (IT management and data centers, in BMC’s case) and customer use-cases, not necessarily on technology. Smaller groups of Ninjas can get together in SIGs to discuss, brainstorm, and do small side projects on such topics of their interest. Online contests like treasure hunts, crosswords, etc. 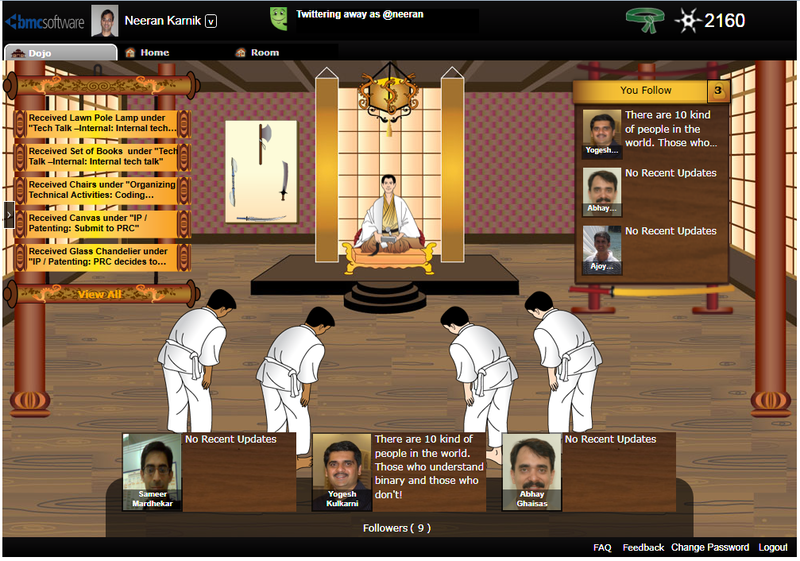 A screenshot of one of the pages in the Ninja Club, powered by eMee. One key element of Ninja Club is its online presence, in the form of a gamified social network called eMee. This was developed at Persistent Systems, and heavily customized by them for BMC. Ninjas get their own profiles and avatars on eMee, using which they can showcase their technical skills, certifications and accomplishments. Points earned for various activities can be exchanged for ‘gifts’ that are used for decorating your house. Promotion to a higher belt results in your moving to a fancier house! Like in the martial arts, a Ninja can have ‘followers’. You can follow your role models or mentors, to keep track of their activities and status updates. Common news items are published to the “Ninja Times”, and visible to all. Non-Ninjas also get their own limited profiles, and the ability to follow Ninjas. A search mechanism allows anyone to find people with specific skills. This melding of the real and virtual worlds in eMee levels the playing field for smart programmers who may not be very social in the real world! The hope is that this Ninja Club initiative will improve the technical vitality of the organization, and make technical careers more desirable and rewarding. By providing cross-team visibility, encouraging collaboration, and peer reviews of design and code, product functionality and quality should also improve over time. Success will eventually be measured in terms of the quality and growth of the technical populace at BMC Software, and being seen as the techies’ employer of choice in the region! Neeran Karnik is an architect at BMC for their Bladelogic Server Automation product. 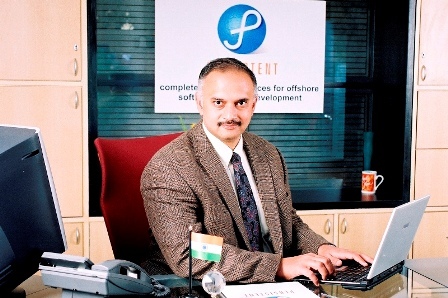 Before that Neeran has worked at IBM India on the datacenter automation and cloud computing products in the Tivoli group, and as a Technical Director and Research at Symantec, and a Research Staff Member at IBM India Research Lab. Neeran has a Ph.D. in Computer Sciences from University of Minnesota, USA. Neeran is also one of the co-founders of Cricinfo. The Wikipedia is fast getting more visibility in India, and not only contributions from India to the Wikipedia increasing, but also Indian Language Wikipedias are seeing rapid growth. All of this is possible because of a grassroots community that is developing across various cities in India, and with the help of an official chapter of the Wikimedia Foundation (the not-for-profit foundation that runs the Wikipedia). Tory Read spent a few months traveling all over India to understand what is happening with the Wikipedia community in India and has written a short e-book based on his experiences that is worth reading. Pune is one of important the cities in this community, not just because it has a very active Wikipedia community (WikiPuneri), but also because it has been picked as the first city where the Wikipedia Campus Ambassador program has been implemented. That’s what Srikeit Tadepalli, an MBA student in Pune, India, told me one day in June. He’d been a below-average student with few college options, but a prestigious school saw his Wikipedia achievements and admitted him to its communications program in spite of his test scores. Now, he’s thriving. 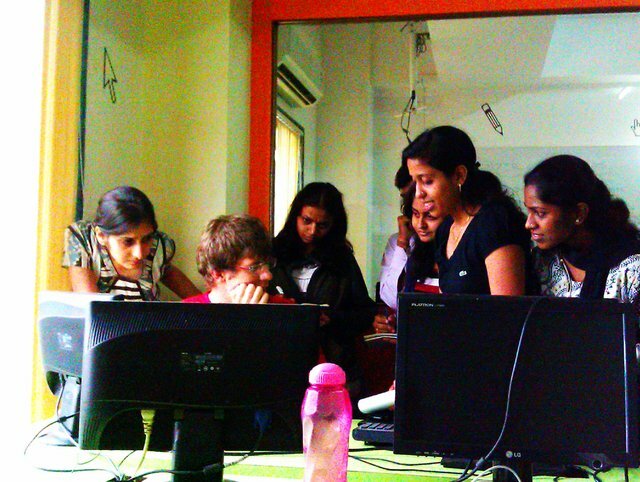 There is no mistaking that the [Campus Ambassador] training introduced a new vibe to Wikipedia activities in Pune. It feels youthful, energetic and hip, intentionally designed to sell the Wikipedia enterprise effectively to urban college students who are actively participating in 21st century global culture. This new version of the Wikipedia brand will take some getting used to for the established vanguard in the area, which has a more traditional way of doing business. The second week I was in India, conflict between the chapter and the broader community erupted again on the email list. A few months earlier, volunteers from Mumbai and Pune had hatched a plan to host a national conference in Mumbai in November 2011, and they’d requested that the chapter support their efforts. It took some weeks for the chapter to reply, and when it did, it wasn’t with a “yes” or a “no.” Instead, it proposed a framework to establish a set of procedures and guidelines for planning national conferences, including a national competition to determine which city should host it. In the interim, the ad hoc volunteers in Mumbai and Pune had done extensive research on venues and costs, and they had invited Jimmy Wales to attend the event. They had energy, vision and momentum, and they were taken aback by the chapter’s response. Tempers flared, and behind-the-scenes conversations commenced-dozens of community members spent hours on phone calls, Internet chats and email. There are many more interesting stories in the book. Anybody interested in Wikipedia, or internet communities should take a look. “Citizen Empowerment for Better Governance” – the aim was to complete the MVP for this in 2 days! We had a record attendance of 25-30 people on both days. I was skeptical of how much we could do, how much we can organize and if we can manage to keep everyone satisfied – it was make or break! http://kipwiki.heroku.com — WE DID IT! This portal is almost complete (a few technical glitches but over all I would say it was success in more ways than one. The source code is hosted on github: https://github.com/punerb/kipwiki The hitch was that MongoHQ use v1.6 which does not support $nearSphere conditions for geo-spatial indexing — this causes our geo-location to go for a toss. This was not mandated but recommended (LoL — “mandatory pair-programing” — an oxymoron?). This photo says it all. Everyone paired with someone automagically — and it worked like a charm. There were plenty of more modules build, tracked and tweaked. However, everyone was open to change, talking to everyone AND most importantly committed to “GETTING IT DONE”. – mongoid-paperclip (with S3 as storage). 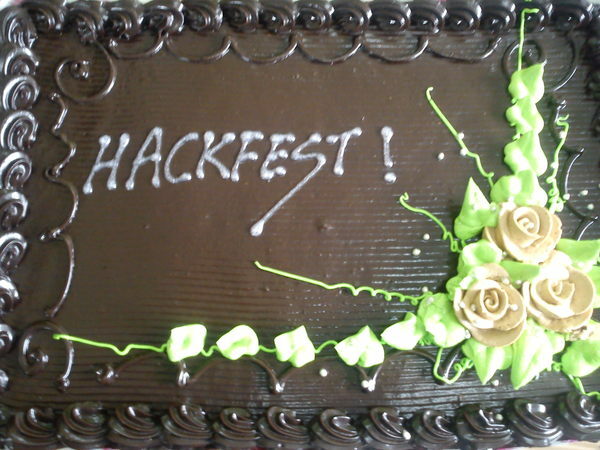 Peter even bought a ‘Hackfest’ cake – what more could we ask for? We worked on the first day till 11.30pm and then crashed to be ready for Day2. 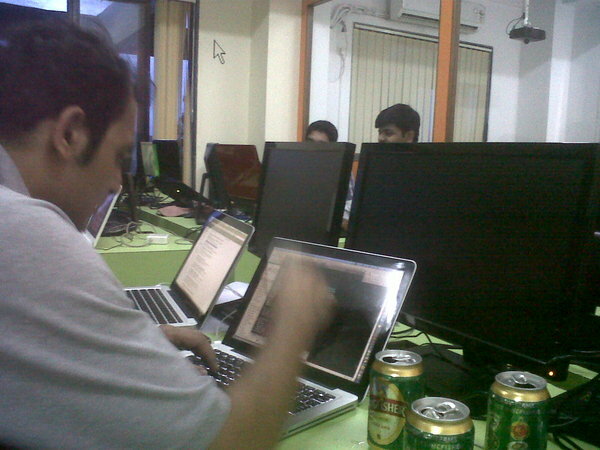 Day2 was very very productive and we were coding till 1.30am in the night to reach the finish. 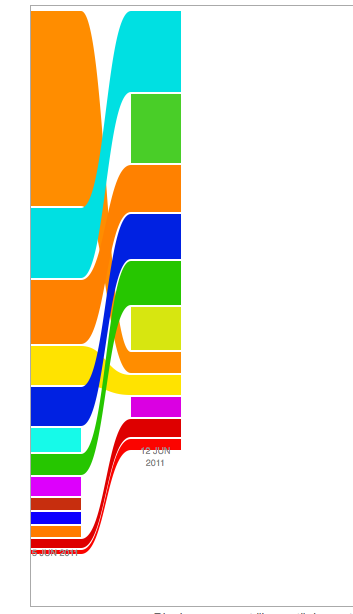 We were able to churn out a LOT of code indeed. But it did not start there. We had to design the web-portal with our designers, we had pivotal tracker to track stories and rspec to test the models. No we did not do ALL this. We used Pivotal tracker to check and evaluate stories and unfortunately we did not do Test Driven Development. Some of the things that we need to improve. The excellent part of was that we had some rock-star programmers – who churned out a LOT of awesome code and we had some excellent designers who helped with designing. We missed out on Test Driven Development!! This is one thing that we need to do differently at the next hackfest. Its very important to see this work beautifully and always be ‘code green’. 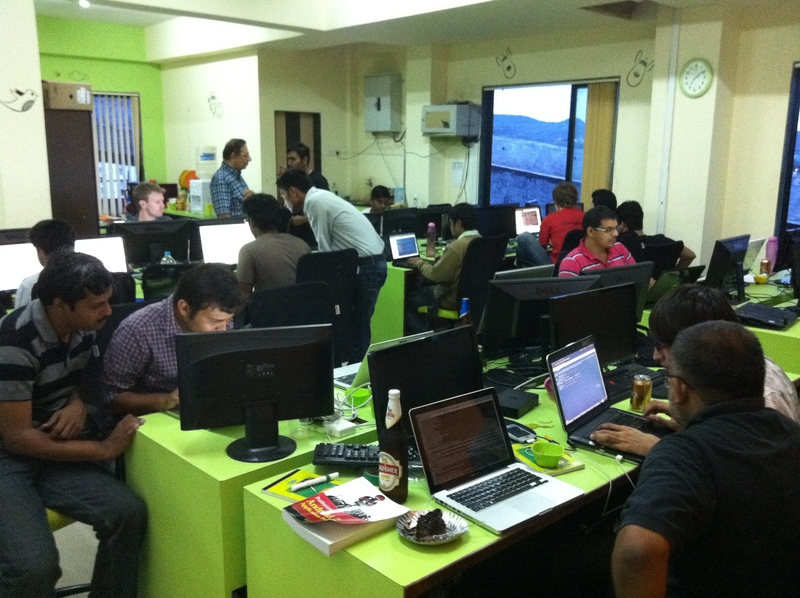 All in all I think we are ready to be a part of RailsRumble later this year and I do intend to get Pune.rb on the RailsRumble map! Update: At this meeting (which is now over), it was decided to form various sub-committees that will work on different aspects of TEDxPune. If you’re interested, please sign-up here. A group of volunteers has been formed to put up a TEDx program in Pune later this year. And, since we would like to put up a world class show, we need the help of a lot of volunteers to be able to achieve this. Please join the TEDxPune mailing list and help out. There will be a kickoff meeting this Saturday, 27th February, from 5pm to 7pm at SICSR (the Symbiosis Institute of Computer Studies and Research, Model Colony. Map: http://sadakmap.com/p/SICSR). Please attend. Anyone who is enthusiastic enough can attend. It’s free. TEDx is a local version of the TED program. You might have already heard of TED, or have seen some TED videos. TED is non-profit group that holds conferences all over the world with the single intention of spreading the most inspiring ideas to the widest audience. TED believes in the power of ideas to change attitudes, lives and ultimately, the world. So TED is creating a repository of ideas, in the form of talks given by some of the world’s most original and insightful thinkes, and videos and transcripts of these talks are disseminated freely to anyone who is interested. The name TED stands for “Technology, Entertainment and Design,” but overtime, the idea has grown to encompass any idea that can (or should) change the world. TEDx is any locally organized conference that follows the TED guidelines. A TEDx can be a half day or a full day event consisting of talks by various invited, carefully selected speakers. No talk can be over 18 minutes in length. The talks should be cross-disciplinary, and must go over a wide range of topics. And there should be nothing other than these talks. No panels, no break out sessions, nothing. Just talks, and discussions. And we would really like the talks to be mindblowing. Something that will spur the audience into action. Or fill them with wonder. I am sure there are many, many such people in Pune. But we need your help in finding them. Some of the potential speakers are well known, established names. Like Jayant Narlikar; or Arvind Gupta. We will try to get people like those; but in addition, we would like to find young and upcoming not-so-well-known speakers who have the passion and new ideas that will inspire the next generation. Will you help us find them? If yes, please come for the meeting on 27th. And join the TEDxPune group. (or follow @TEDxPune on twitter).